You may already have a functional and practical office design, but does it really embody your brand? Branding is important for any business, it gives you the opportunity to stand out from your competitors and to encourage pride within your employees. If you have clients, customers or prospective employees visiting your offices regularly, branding is crucial. You want people leaving your premises remembering who you are and being impressed by your corporate culture. Your office walls and partitions are the perfect blank canvas to promote your brand and ethos. Glass partitions can be beautifully designed with manifestations which not only provide privacy but also add the wow factor. Similarly, productivity and staff morale can be increased by applying motivational quotes. There are certain regulatory requirements when it comes to glass partitioning, in a previous blog we explained the regulations in more detail, click here for more information. Vinyl artwork is also a great way to emphasise a company’s mission’s statement or core values. Logos, keywords or images of products or the local area can inject some fun into the office. With clients and customers visiting the offices, vinyl graphics are quite the statement piece, which means they will leave an impression on visitors whilst brightening up the office space. If your organisation has particular links to the locality, images from the local area could be a good way to transform walls or a vinyl representation of the company’s history can convey your evolution from humble beginnings to present-day success. When going through the design process, office furniture plays a rather prominent part of the design and are a great way to use your brand colours. Furnishings tend to pull the design together but you will need to consider the fabric choices carefully because going overboard may be a little bit overwhelming. For every strong colour choice you make, choose a calmer colour to couple with it, that way there’s still bursts of colour but it’s not overpowering. Different fabrics can be used on screens, operator chairs, blinds, and carpets. 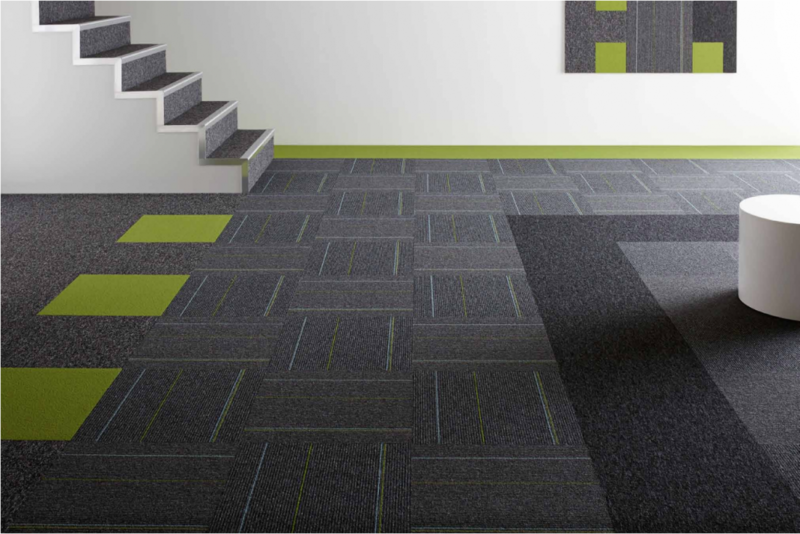 A hint of colour can be incorporated into carpet tiles for a subtle effect or you can go bold with a contrasting border for example. It’s an obvious one, but being fun with paint can add interest to the design. In addition to neutral colours, which are generally preferable to create a light, bright office space, a splash of colour on feature walls or painting columns injects interest. Integrate shapes from the corporate logo into designs on the wall, geometric shapes work particularly well here. Click here to find out more about the importance of colour in the workplace. A lot of businesses tend to neglect areas that should reflect their company’s brand. One area of the workplace that is vital for creating a good first impression, is the reception, or waiting area. This is a chance for your business to create a space that is inviting and pleasing on the eye, whilst promoting the corporate image you wish to convey, such as ‘professional’ or ‘creative’. Having a unique statement sign with your company name and/or logo helps to increase brand identity and makes a dramatic impact on arrival. Signs can be made of many different materials such as glass, metal or Perspex, or why not use a biophilic design for extra impact. Click here to find out more on the importance of reception areas. If you would like any help or advice about incorporating your brand into your office design, please get in contact by calling on 01444 474728 and the Office Changes team will be more than happy to help.